I got one of the coveted 200 tickets to the Healthy Living Summit this August! I’ve never been to a blog conference before, but one created by six and now planned by one of my favorite bloggers seems like a great place to start. And in other good news, I’m supposed to find out where I’m getting moved to for my next job rotation this week. Once I know that I can figure out if I’ll actually be able to go to the Healthy Living Summit and start booking flights and accommodations. Keeping my fingers crossed! 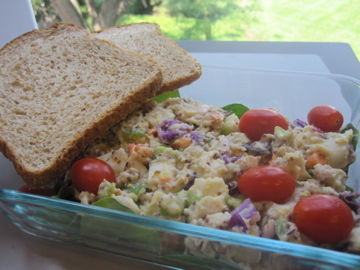 Lunch today was something I haven’t had in a while – tuna salad! I actually was supposed to go out to lunch with a blog reader, but she had a last minute obligation so I threw together this meal last night. It was just one can of albacore tuna, 3/4 cup chopped veggie mix, 2 TBSP Nayonaise, 1 spoonful dijon mustard, and some garlic powder. I served it on a bed of spinach with two pieces of bread for scooping. An apple rounded out the meal and I had some baby carrots for a snack. So I had big plans to finally start swimming after work today. I tried on my old one-piece from camp (still fits! ), bought a hot pink swim cap, and got goggles that wont leak. I even remembered to bring it all to work with me so I could go to the pool afterward and fool around with a kick board and some basic strokes – just splashing around a little to get my feet wet (PUN:) ). I was so psyched about it all day and then BAM. Pool is closed for swim team time trials. All my plans were ruined and I was super bummed! Instead I stayed at work a little longer and alphabetized shoes (I live an exciting life). Hopefully I’ll be able to get into the water later this week. I really have no idea what I’m doing, but everyone starts somewhere right? Tonight I had another IIN practice health history with a blog reader (hi!!). I’m getting more comfortable with them, but I’m really bad about not giving advice and not interjecting personal stories. Those are no nos for this initial consultation and especially so since I’m not certified yet. I’ll get better with each one and cannot thank all of you volunteers enough for being my guinney pigs! 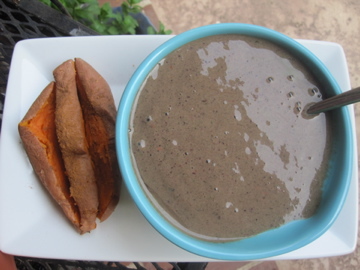 Dinner was…a smoothie! Seriously I have so many ideas and recipes I want to try with solid food, but this heat is making me crave Green Monsters. Solid food is for winter. I made a Very Berry Green Monster and microwaved a sweet potato for some carbs. I’m also planning on having a banana with almond butter in a little bit as an alternative to the sugary snacks and chocolate chips I’ve been having recently. Day one of cut back on the sugars is going well so far! I’m debating turning on the Bachelorette, but I’ve heard this season isn’t that great and I really don’t want to get sucked in. Maybe I’ll listen to some IIN modules instead. How productive would that be? Are you going to the Healthy Living Summit? Are you watching The Bachelorette this season? where is HLS this year? haha I totally had a can of tuna too. unfortunately all I had to mix in were a few carrots, celery, and avocado. Still good! i bought one toooo! i hope i can go depending on if we’re going to california then! i guess we’re both up-in-the-airskies! I’m going to the Healthy Living Summit! Hope to meet you there!! No sadly not going to the Healthy Living Summit. Maybe next year! But yes, I am watching the Bachelorette this season although I’m not sure why. I just got back from watching it with some friends. Other than the dramatic parts, it’s a pretty boring season! Disappointing, since I usually get so into this show! that’s so exciting that you got your ticket!! and mmm, tuna salad sounds wonderful. Gahh I wish I could go, but can’t afford it at this time 😦 But I am so happy you are going, I bet it will be fabulous! Lucky girl! I couldn’t swing it this year thanks to my wedding, but it actually wouldn’t be a bad drive from here. Oh well! Your tuna salad looks fab – mine have been pretty boring lately. The Bachelorette is good so far! I mean, it’s just getting started but it hasn’t been boring. I watch it on hulu so I’m going to watch last night’s episode today… I can’t wait to see what Bentley did! How exciting about HLS! Hopefully this week will go fast so you find out about your job placement! I think I have finally mustered up the courage to start my own blog. 🙂 Do you have any pointers? I have been watching The Bachelorette a little bit but I just kind of have it on in the background while blog reading. I had to work last night so I’m just catching up on both now!